THE MAZDAS ARE HERE! THE MAZDAS ARE HERE! 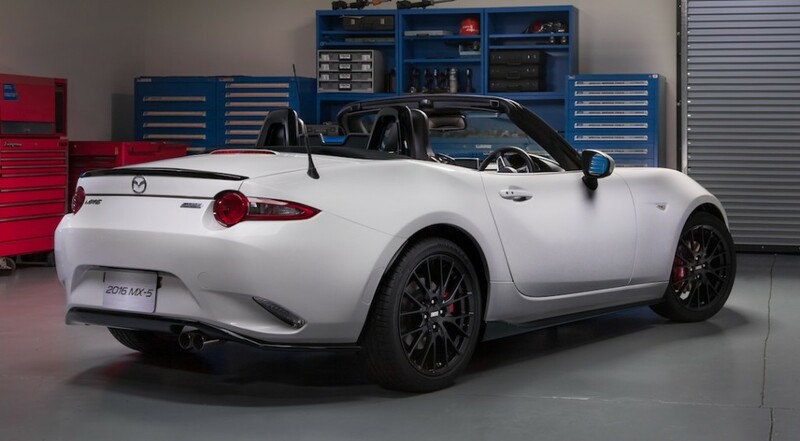 by Jim Corbran, Automotive Columnist To those of you who’ve been eagerly awaiting the arrival of the 2016 Mazda MX-5 Miata: it won’t be long now. A ship recently pulled into the Port of San Diego with the first North American shipment of the popular little roadster, and reports are that many of the cars are the Launch Edition models, in red with tan interiors, which are pretty much sold already. But then again, can you believe everything you read on the internet? The article I read about the Launch Editions, on the mazdamx5.org web page, states that “The ones that arrived this week are the exclusive Launch Edition ($30,495), all in Soul Red with a Sport Tan leather interior. They are all in the top-end Grand Touring trim, and are limited to 1,000 units. Most if not all have already been sold.” Well, the accompanying photo, which we’re also including here, clearly shows white and dark gray cars as well. Hmmph. The new MX-5 has been totally redone, with all-new styling and many new features. You can click the link below for the full scoop. more info at: http://www.longlivetheroadster.com/#overview ### The post THE MAZDAS ARE HERE! THE MAZDAS ARE HERE! appeared first on Buffalo Cars.